Am I ready to take Foundations in Writing? Students are expected to be able to read at least at an 8th grade level and recognize basic parts of speech. While there is a fair amount of writing, students will start from the beginning in terms of how to approach, prepare, and produce a final product. 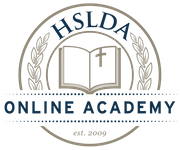 This course is meant to provide students with a solid foundation in writing, grammar, and literature upon which they can build in subsequent high school English courses at HSLDA Online Academy.